Below, January 30, 2019 video by the Hakai Institute re. 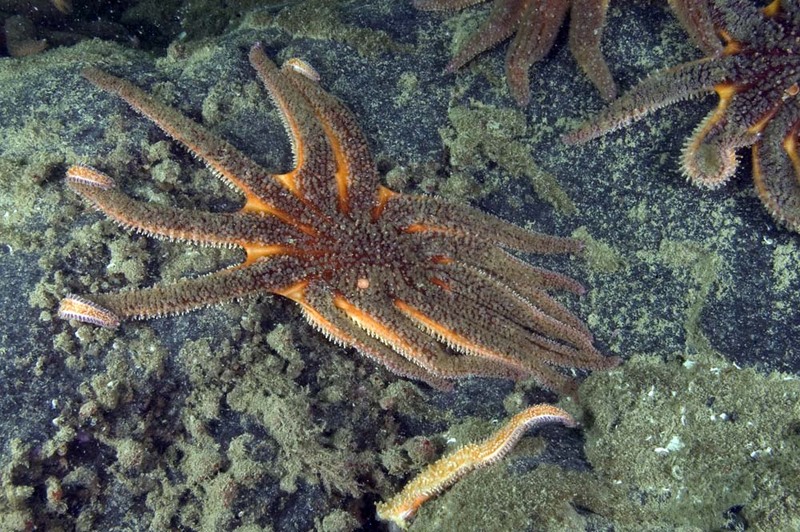 Sunflower Stars and Sea Star Wasting Disease. Why share this information? It is often marine species that testify to environmental problems first; that serve as indicators for the resources upon which we too depend. The hypothesis is that the sea stars have succumbed in an unprecedented way because of changed ocean conditions (stressors). For me, this is an additional motivator to do what I can to reduce impacts of carbon and harmful chemicals. July 2018 – Research published by Burt et al) quantifies the importance of Sunflower Stars in maintaining kelp forests. Includes that the decline of Sunflower Stars “corresponded to a 311% increase in medium urchins and a 30% decline in kelp densities”. See video below and news coverage on the research at this link. Green Urchins grazing on Split Kelp. ©Jackie Hildering. 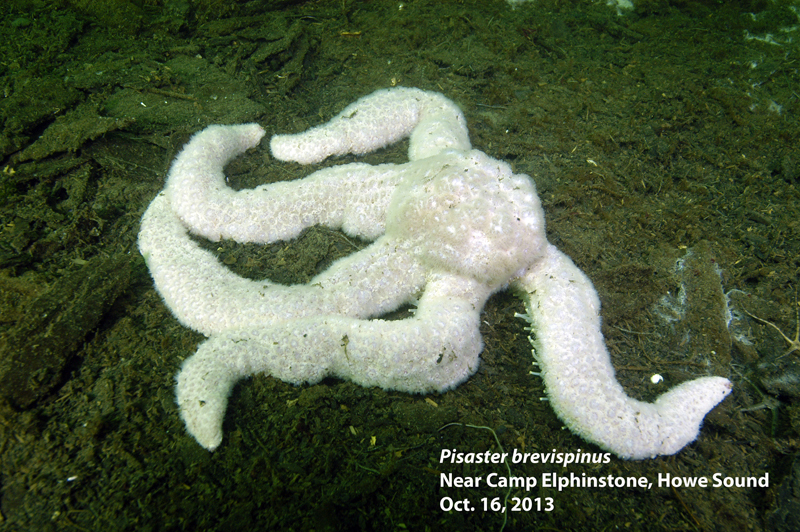 March 7, 2018 – Additional research by Hewsen et al has found that, while a virus appears associated with the disease in Sunflower Stars, the situation is more complex and the virus does not appear to be the cause in other sea star species. The cause is “likely a complex tango of diverse potential pathogens and environmental conditions” / “We speculate that SSWD may represent a syndrome of heterogeneous etiologies [causes] between geographic locations, between species, or even within a species between locations.” Those considered in the paper in addition to viruses: Drought / excessive rainfall; freshwater toxins (transmitted by excessive rainfall post drought); temperature swings. 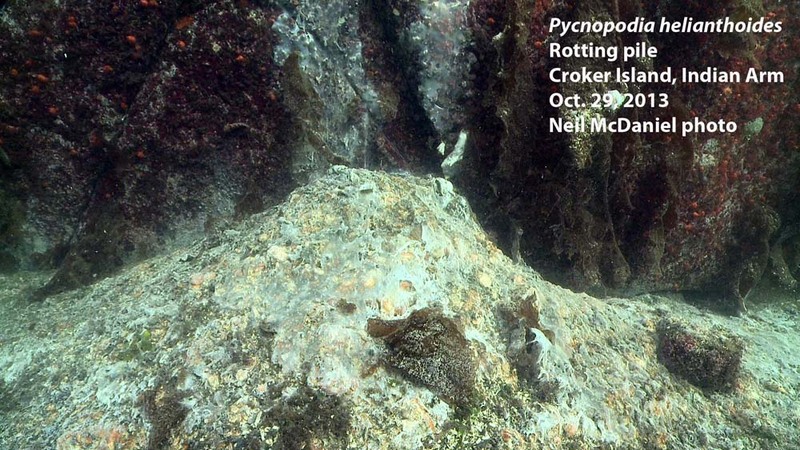 Documentation by Neil McDaniel showing what can happen in the absence of sea star predators of urchins. Site is Sakinaw Rock near Sechelt, British Columbia. Research published in June 2018 (Schiebelhut et al), specifically on Ochre Stars, found that the genetic makeup of the species has changed since the outbreak. Young Ochre Sea Stars are more similar genetically to adults who survived than to those who succumbed. This “may influence the resilience of this keystone species to future outbreaks”. The findings of an additional March 2018 paper (Miner et al) include ” . . . we documented higher recruitment of P. ochraceus [Ochre Stars] in the north than in the south, and while some juveniles are surviving (as evidenced by transition of recruitment pulses to larger size classes), post-SSWD survivorship is lower than during pre-SSWD periods. Burt JM, Tinker MT, Okamoto DK, Demes KW, Holmes K, Salomon AK (2018) Sudden collapse of a mesopredator reveals its complementary role in mediating rocky reef regime shifts. Proceedings of the Royal Society B 285(1883): 20180553. Schiebelhut, Lauren (2018), Supporting Files for Schiebelhut LM, Puritz JB & Dawson MN (2018) Decimation by sea star wasting disease and rapid genetic change in a keystone species, Pisaster ochraceus PNAS, UC Merced Dash, Dataset. Cornell Chronicle, Scientists unravel complex factors of starfish diseases. Has been raging since June 2013. Unprecedented in both range, duration and number of species impacted – 20 species of sea star species since 2013 from Alaska to Mexico (local variation in intensity of the disease and which species are impacted the worst). It is one of the largest wildlife die-off events in recorded history. A virus had been found in sick sea stars but this virus has been around since at least 1942 (was isolated in preserved sea stars). A stressor (or stressors) must be reducing the resistance of the sea stars to the virus.Virus is “Sea Star associated Densovirus” (SSaDV) (Hewson, et al www.pnas.org/content/early/2014/11/12/1416625111.abstract ). A correlation was found between increased temperature and death in sea stars but that other factors are likely play a role as well (Eisenlord, et al www.ncbi.nlm.nih.gov/pmc/articles/PMC4760142). Current situation: Varies by location and species of sea star. While there have been some “waves” of baby and juvenile sea stars, numbers of all species remain low and signs of wasting continue. From my own observations on NE Vancouver Island: Here, Sunflower Stars are impacted the worst (the largest sea star in the NE Pacific Ocean with 20+ legs). Leather Stars may be more impacted than in other areas. Ochre Stars appear less impacted than in other areas. I have seen waves of Sunflower Star babies and juveniles. What I find most plausible is that the babies are the result of adults spawning at depth, where it is colder (reduced stressor). A stressor or stressors then reduces the resistance of the babies and juveniles in shallower water whereby they may succumb to SSWD. 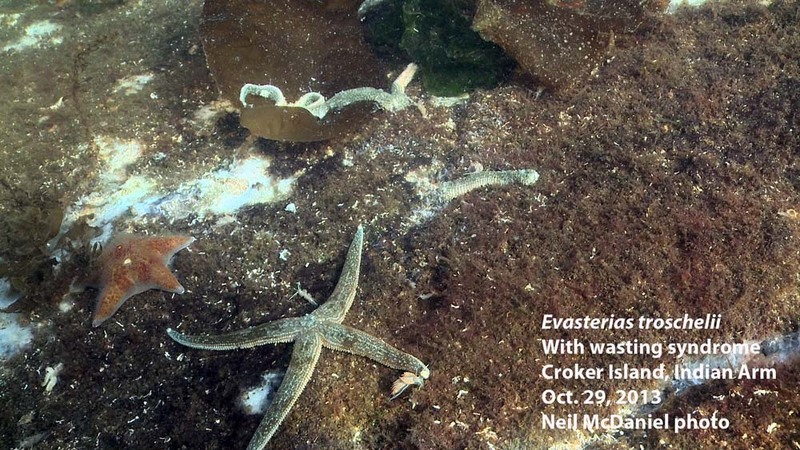 In terms of ecosystem impacts, consider the important role of many sea stars as predators. I put forward that this can be likened to the death of many Sea Otters. With less sea stars there are more of their prey like mussels and clams. But, with less sea stars (especially Sunflower Stars), there are definitely more urchins which graze away more kelp. Thereby, there is less habitat for many species and a loss of biodiversity. My album of photos of sea stars with symptoms can be found at this Facebook link. Lloyd, M, Pespeni, M (2018) Microbiome shifts with onset and progression of Sea Star Wasting Disease revealed through time course sampling. Scientific Reports. Hewson I, Bistolas KSI, Quijano Cardé EM, Button JB, Foster PJ, Flanzenbaum JM, Kocian J and Lewis CK (2018) Investigating the Complex Association Between Viral Ecology, Environment, and Northeast Pacific Sea Star Wasting. Front. Mar. Sci. 5:77. doi: 10.3389/fmars.2018.00077. 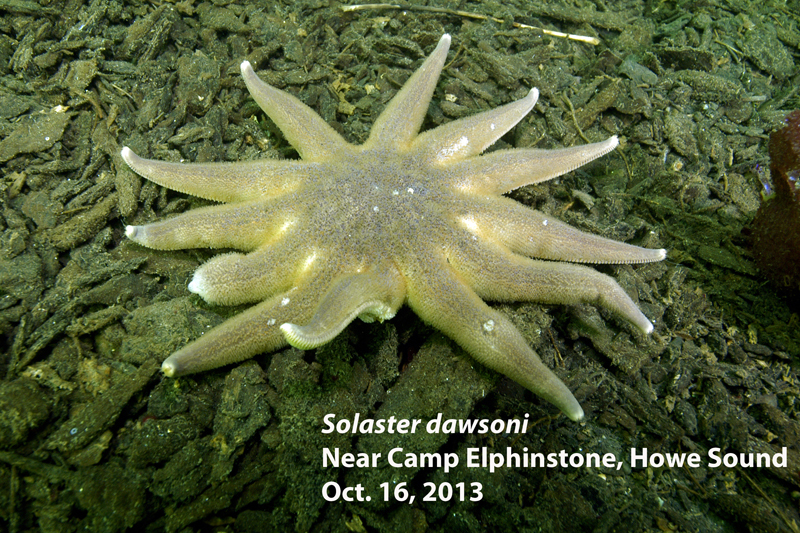 Update March 1, 2015: While symptoms of Sea Star Wasting Syndrome are still being seen in BC and I have seen no adult Sunflower Stars in the sites I have been monitoring on NE Vancouver Island, in several areas in BC, we are beginning to see juvenile Sunflower Stars. 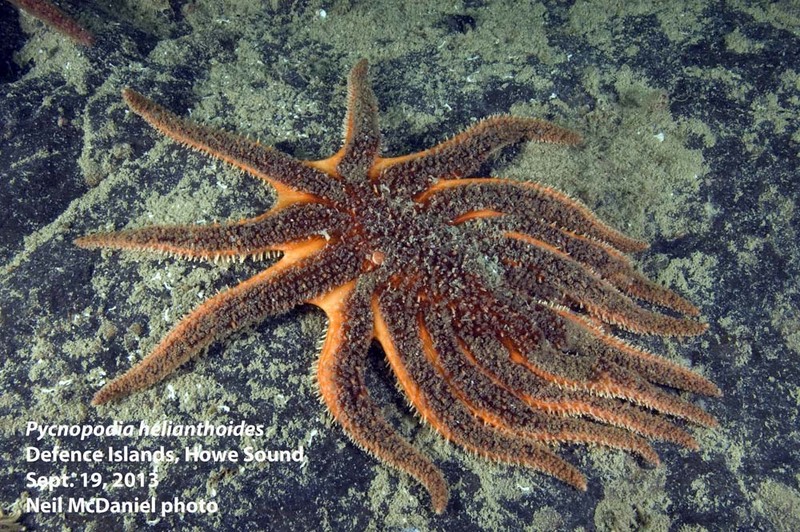 Sunflower Stars are the species that appeared to be most impacted in many areas of BC. Where are the young Sunflower Stars coming from? It may be, and this is my speculation, that there are Sunflower Stars at depth that survived the Syndrome possibly because they were not exposed to the same stressors e.g. the water at depth may be colder. Update December 2014: Seeing juvenile Sunflower Stars around Northern Vancouver Island. The hope is that there might be a deep, cold water reservoir of animals. I suggest that this offers further support that increased temperature may be the stressor that has increased the pathogenicity of the virus. There has already been much reporting on the gruesome epidemic spreading like wildfire through several species of sea star in the NE Pacific Ocean. “Sea star wasting syndrome” is incredibly virulent and is causing the mass mortality of some sea star species in British Columbia and beyond. 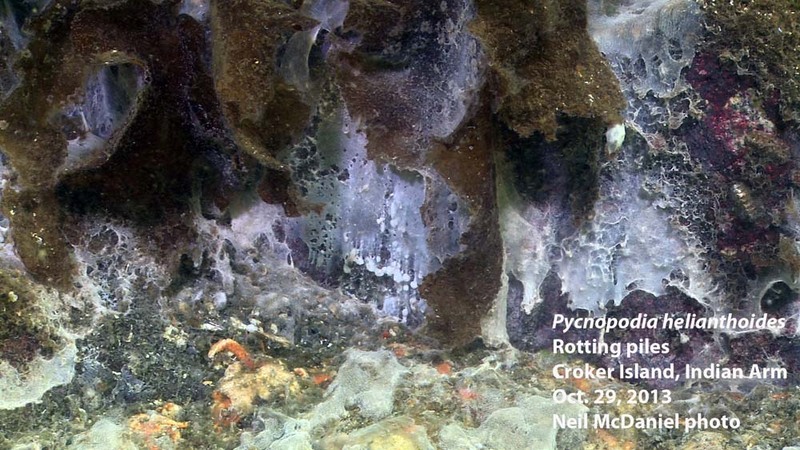 “Sea stars go from “appearing normal” to becoming a pile of white bacteria and scattered skeletal bits is only a matter of a couple of weeks, possibly less than that” (Source #1). What I have strived to do below is bundle the state of knowledge so far, relying heavily on the expertise of two extraordinary divers and marine naturalists: (1) Neil McDaniel, marine zoologist and underwater photographer / videographer who maintains a website on local sea stars and has put together A Field Guide to Sea Stars of the Pacific Northwest, and (2) Andy Lamb, whose books include Marine Life of the Pacific Northwest. I am hoping that kayakers, beach-walkers and fellow divers will help monitor and report on the spread of the disease via this link on the Vancouver Aquarium webpage but I am also hoping that all of us may learn from this tragedy that has impacted “one of the most iconic animals on the coast of British Columbia . . . more abundant and diverse in our waters than anywhere else in the world” (Source #3). Sea star wasting syndrome reminds us of the fragility of ocean ecosystems; how very quickly disease could spread in the ocean; and how we are all empowered to reduce stressors that increase the likelihood of pathogens manifesting as disease or even that pathogens enter the environment (e.g. sewage). Update January 18, 2014 – Video by Neil McDaniel showing the extent of the mortality in some parts of southern British Columbia. Click here. Vermillion star (Mediaster aequalis); video of an afflicted star here. Update January 21st, 2014: Possibly: Rose star (Crossaster papposus) – I have noted symptoms in this species on NE Vancouver Island as has Neil McDaniel in S. British Columbia). Update November 20th: The Vancouver Aquarium reports on which sea stars are and are not affected in S. British Columbia: “The majority of those species affected by the sunflower star epidemic are members of the same sea star family” and that the closely related morning sun star and giant pink star appear to get infected after feeding these “meals”. (Source #10, includes video). 5. As things progress, the animals lose the ability to crawl [and hold grip surfaces] and may even tumble down steep slopes and end up in pile at the bottom. Soon after they die and begin to rot. To date (January 2014), the cause (s) have not yet been identified. Scientific opinion appears to be that most likely the cause is one or more viruses or bacteria that have not yet been identified (more advanced investigations like DNA sequencing and metagenomics are now underway at Cornell University – Source #18 and #19) but toxins and environmental factors have not been ruled out as the primary cause or confounding causes (Source #18). As with any pathogen (like the flu virus), the expression of a pathogen as disease is influenced by number and proximity of individuals and could be exacerbated by environmental stressors. It is NOT radiation [Source #18, #19 and others]. Using cutting-edge DNA sequencing and metagenomics, Hewson is analyzing the samples for viruses as well as bacteria and other protozoa in order to pinpoint the infectious agent among countless possibilities. ”In previous outbreaks the “proximal cause” was found to a vibrio bacterium but “a recent wasting event on the east coast of the United States has been attributed to a virus . . . such events are often associated with warmer than typical water temperatures . . . Please note that we do not know what is causing Sea Star Wasting Syndrome, and the cause may be different in different regions . . . the period prior to Wasting was characterized by warm water temperatures” (University of California Santa Cruz, Source #4). “Do not believe this is related to a warming trend” (Source #18). “Overpopulation” of sunflower stars appears to be a factor with outbreaks occurring where there is a high abundance of sea stars. “Often when you have a population explosion of any species you end up with a disease outbreak” (Source #5). “This could be perfectly normal as a way to control overpopulation” (Source #18). “Some initial samples sent to DFO [Department of Fisheries and Oceans] and UBC [University of British Columbia] have not isolated a specific causative agent for this sea star die off. More samples are being collected and additional tests will be conducted” (Source #2 and #7). Viruses are notoriously difficult to detect. Cornell University (New York) has begun viral and bacterial culturing (Source #8). Updates will be provided here as they become available. See Source #14 for the results of pathology reports from October 4, November 12 and November 13. 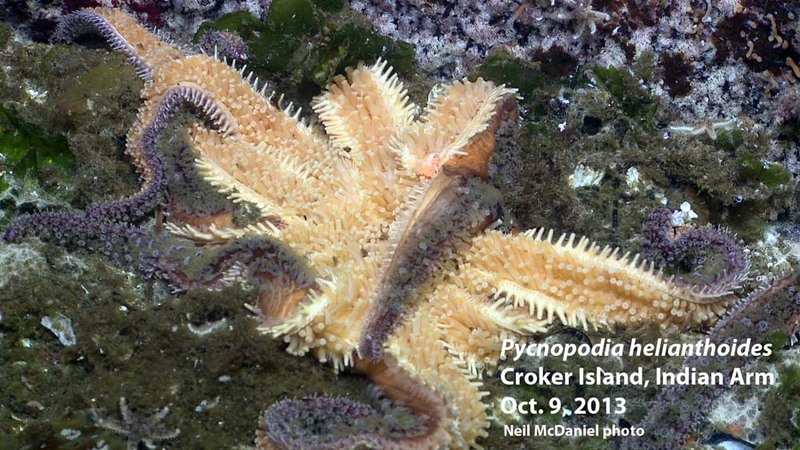 June 2013 – First noted in the intertidal zone in ochre stars along the Washington Coast. “As of December, signs of wasting had been observed at 45 of 84 MARINe sites [USA – Multi-Agency Rocky Intertidal Network] sampled since summer 2013, spanning the entire coast from Alaska to San Diego but varying in intensity from low levels of infection to mass mortality” [and with large gaps in data especially in northern British Columbia]. (Source #17). See map (Source #4) documenting the Syndrome in ochre stars in some locations from Alaska to the Mexican Border. Late August 2013 – first reported in the sub-tidal in Howe Sound (Whytecliff and Kelvin Grove) by recreational diver Jonathan Martin (his photos here; video here). Sunflower stars were the main species impacted. Mass mortality noted in Indian Arm in early October. “By late October the syndrome had been reported from the Gulf Islands, around Nanaimo and into Puget Sound and the San Juan Islands. It appears to be spreading throughout the entire Strait of Georgia and Puget Sound.” [Source #14]. 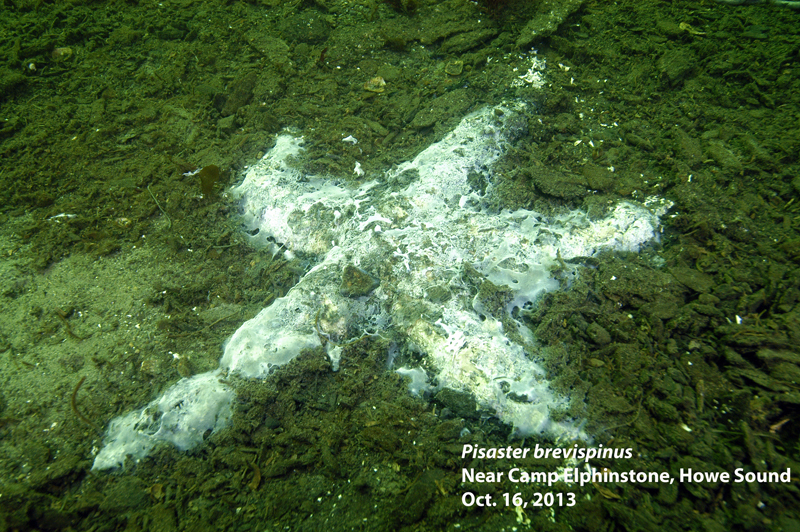 First detected in the sub-tidal in sunflower stars in Washington State as of late October (Source #11 and #17). See a video here of a site in West Seattle before and after the outbreak. Update December 22nd: First reported off Whidbey Island, Washington. Update December 21st: I am very sad to report that I have now found afflicted animals on NE Vancouver Island (Bear Cove, Port Hardy). Please see my blog at this link for photos, details and updates on the progression of the Syndrome on NE Vancouver Island]. Update January 19th, 2014: Morning sunstar with symptoms found in Campbell River [Reported by Dylan Smith]. No outbreaks on the west coast of Vancouver Island [Source #14]. “A smaller and isolated Atlantic outbreak, at points off Rhode Island and Maine, has also been noted.” (Source #12). With regard to finding sunflower stars with the syndrome in Sechelt Inlet “This sighting is both disturbing and perplexing for a couple of reasons. First, Sechelt Inlet is hydrographically quite isolated from the rest of the Strait of Georgia, being a nearly land-locked fjord with minimal water exchange through Sechelt Rapids. 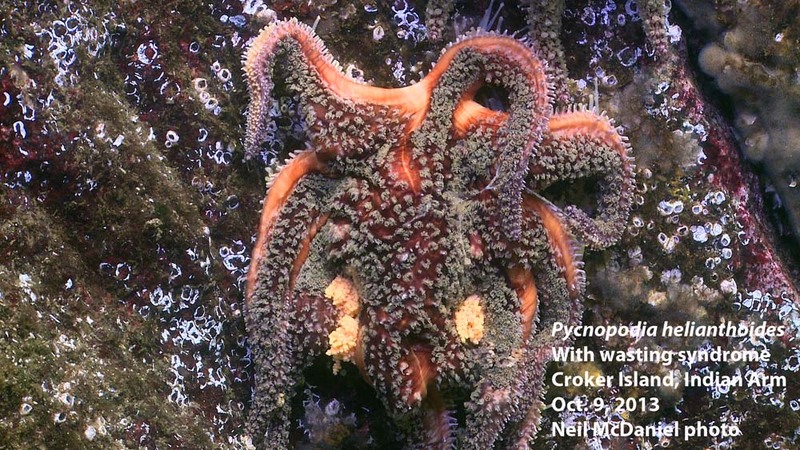 Secondly [in Sechelt Inlet] Pycnopodia is a common sea star, but by no means abundant and certainly not found in anything near the incredible densities (up to 11/square metre) that we have encountered at the Defence Islands in Howe Sound” (Source #1). Jeff Marliave (VP of Marine Sciences at the Vancouver Aquarium) relates that the epicentre of the outbreak in Sechelt Inlet appears to be Egmont and that this correlates with a high abundance of sunflower stars there (Source #8). Baby sea stars now seem to be coming back to areas where adult sunflower stars have been wiped out (Source #18). You can aid understanding of the range and spread by inputting your data at this link on the Vancouver Aquarium webpage. Never to this large a scale. 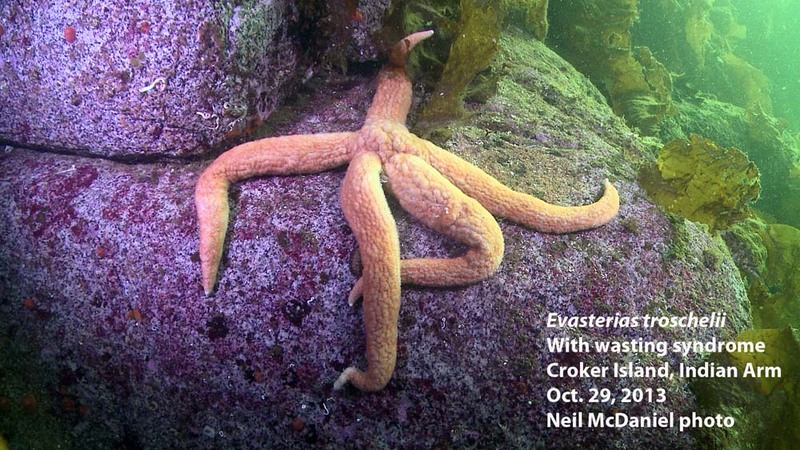 “Although similar sea star wasting events have occurred previously, a mortality event of this magnitude, with such broad geographic reach has never before been documented.” (Source #17). Update November 30: Sunflower die offs [on much smaller scale] have been noted in the past in Barkley Sound. 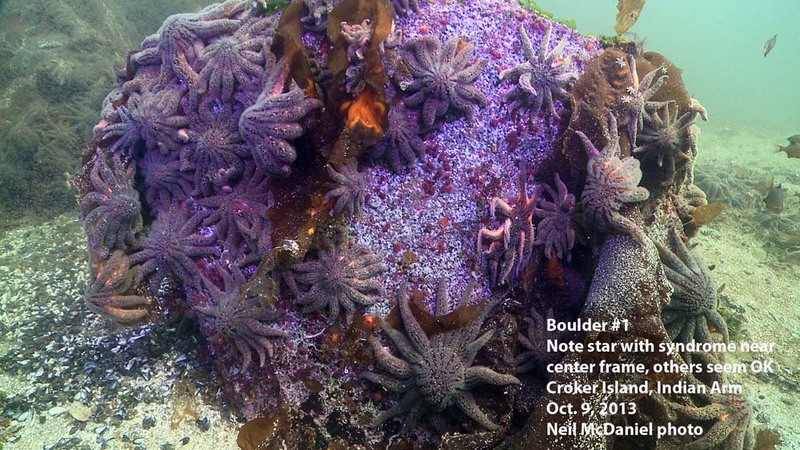 In 2008 ochre star die offs were documented in Barkley Sound. In 2009 Bates et. al. reported on this and observed that the prevalence of disease “was highly temperature sensitive and that populations in sheltered bays appeared to sustain chronic, low levels of infection.” (Source #14 and #15). “Similar events have occurred elsewhere over the last 30 years. 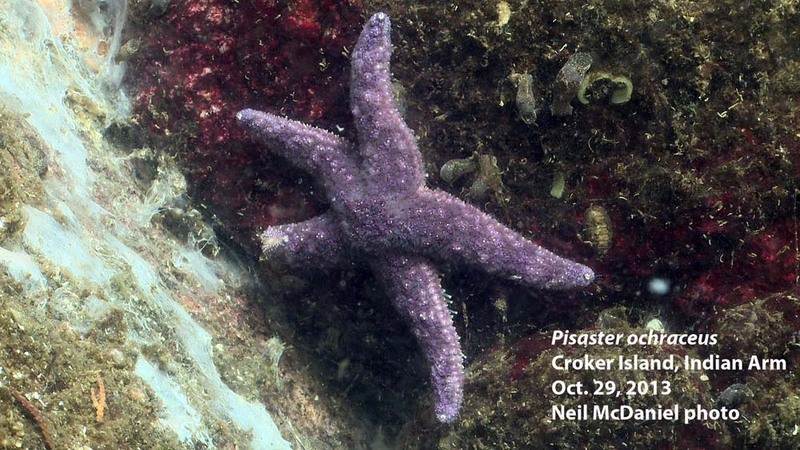 Sea stars have perished in alarming numbers in Mexico, California and other localities” (Source #2). “In July, researchers at the University of Rhode Island reported that sea stars were dying in a similar way from New Jersey to Maine . . a graduate student collected starfish for a research project and then watched as they “appeared to melt” in her tank” (Source #5). The impacted sea star species are carnivores, feeding high up in the food chain. 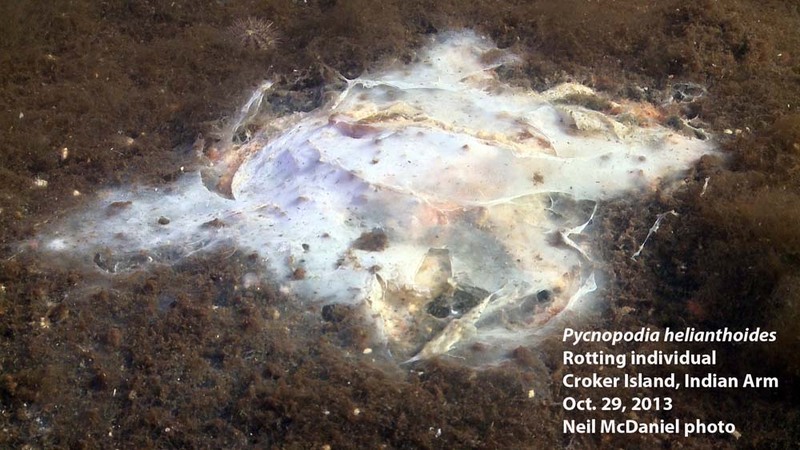 This massive die off may lead to shifts / changes in marine ecosystems since there will be less predation by the affected sea star species (Source #9 and #12). Their prey includes: bivalves like mussels, marine snails, urchins and sea cucumbers. “Once that disease is in the environment, it can be difficult to get the population [of the affected sea stars] back” (Source #5). Ecologists consider sunflower and ochre stars to be keystone speices because they have a disproportionately large influence on the distribution and abundance of many other species. Scientists anticipate that such a large mortality event in keystone species could change the intertidal and sub tidal seascapes . . . Previous examples of large-scale, mass mortality of individual marine species have resulted in dramatic ecosystem-wide changes” (Source #17). Seeing baby sunflower stars back where adults have been wiped out in Howe Sound. Getting species like agarum kelp back (good habitat that was suppressed due to previous abundance of sea stars) but also seeing green urchins come back (will graze on kelp like sea stars do). (Source #18). 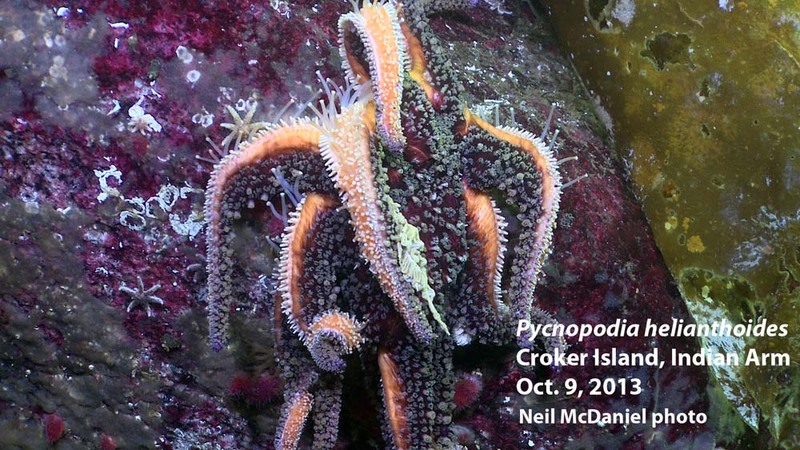 Video (7 min) on the state of knowledge on the Syndrome (January 2014) and showing the progression of the Syndrome in sunflower stars around Washington / Southern BC. Email communication with Neil McDaniel. Email communication with Andy Lamb. Shellfish Health Report from the Pacific Biological Station (DFO) conducted on 1 morning sun star and 7 sunflower stars collected on October 9, 2013 at Croker Island, Indian Arm; case number 8361. Email communication with Jeff Marliave. Vancouver Aquarium; January 21, 2014; Presentation – Mass Dying of Seastars in Howe Sound and Vancouver Harbour (Dr. Jeff Marliave and Dr. Marty Haulena). Very good summary of the situation: what we know, and what we don’t know. Thank for the write-up! Great overview of a tragic progression along the U.S. west coast, too. Glad I can share this. Thanks. excellent summary – thank you! Thank you Jackie for putting this together. I know you will keep up informed when more is known. So frightening and terrible. Is it possible that it it being spread by Sea Gulls? I have watched Sea Gulls eat Starfish along the shoreline at low tide. Could it be that they are eating infected ones, and when they digest the Starfish the droppings spread the disease into the water at some other point further away? Hello Ray, Valued thinking about disease vectors and why there may be some areas impacted from Washington to Alaska while others are not. If the pathogen survived the gut of seagulls, this would be plausible. I suspect however that the virus/bacteria is present in a greater range but that it does not manifest as disease due to the absence of stressors. But . . . we’ll wait and see what the experts determine. No evidence of radiation being a factor Dan. Could the Fukishima fallout be the culprit here? It’s already showing up in Pacific seafood. Hi, I hadn’t noticed your update about the sunstars until I came to let you know what I’ve seen the last few weeks. Doing a night training dive over on Quadra I thought I saw some small sunstars and then a day or two later a gull left one on our dock, got a pic of it. Glad to see them coming back. Can’t figure out how to send you a copy of the pic, if you would like to see it let me know how. Hello Lyndell, Thanks so for your observations and concern. The photo with the gull might be a particularly good engager re. the juveniles appearing to make a comeback. 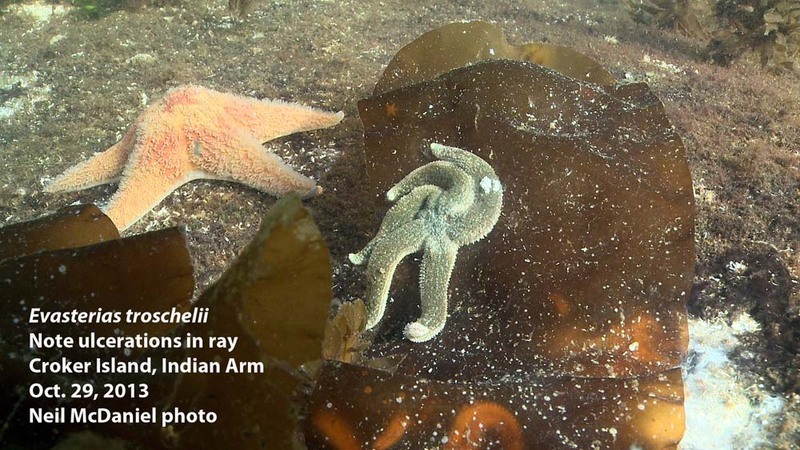 It is best if the Vancouver Aquarium gets the photo with location via http://www.vanaqua.org/act/research/sea-stars. Would this work for you?